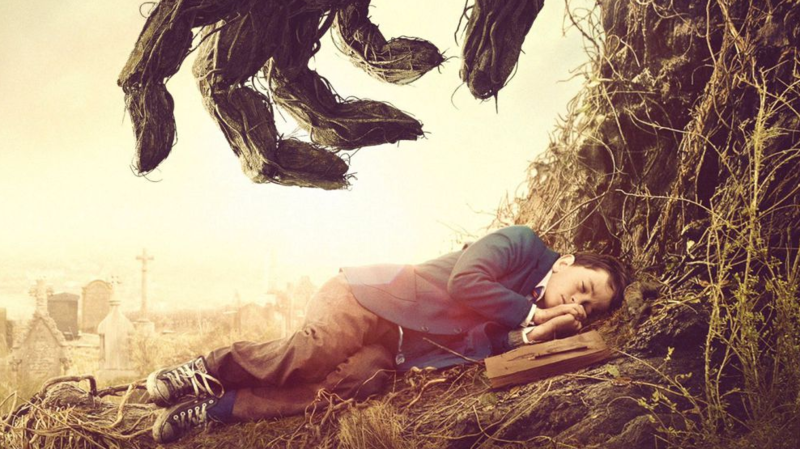 A Monster Calls Review | Spielberg's influences are keenly felt. "If Bayona weren’t comparable to Spielberg in his themes and approach, then certainly he’d warrant the comparison in terms of the professionalism of his craft. " "In an era in which computer graphics leave cynical audiences with a sense of “been there, done that,” A Monster Calls freshly awakens some little remaining bits of our awe. " Steven Spielberg’s influence on J.A. Bayona was apparent in Bayona’s last movie, The Impossible, in which a family registers the approach of a tsunami in a way that directly echoes the Jurassic Park scene where the dino stomp makes the puddle dance. The loving homage continues in A Monster Calls, from the superficial (a tree coming to life outside a boy’s window, a la Poltergeist) to the serious (that boy grappling with domesticity turned upside down, this time in the impending loss of his cancer-stricken mother). The wonder Bayona evokes is familiar Spielbergian territory, but unlike the recent output of his master, Bayona has intensified its gravitas through the mechanics of a solid weepie. 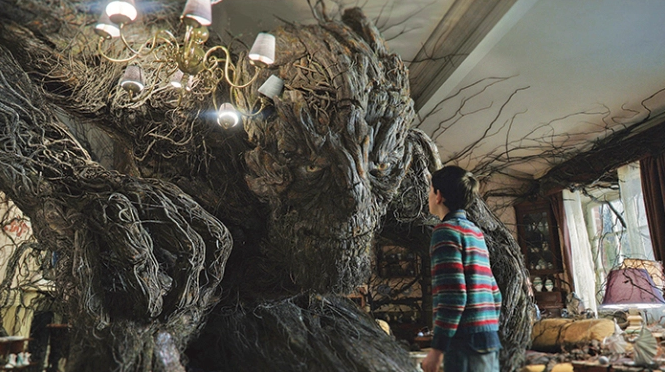 A Monster Calls is, in effect, a manual for a child’s processing of grief. It’s never seriously in doubt that his mother (Felicity Jones) will succumb to the disease, but this movie is not about the avoidance of spoilers. It takes the mature viewpoint that – spoiler alert – life will contain serious doses of pain, and you might almost be the lucky one if you’re experiencing just the physical, while the emotional is borne by others. And if you do have to be the unlucky one, here’s hoping you’ve got a gnarled thousand-year-old tree outside your window who will tell you stories about human nature that might help you process it all. The Old Man Groot film didn’t have the same charm as Logan. That tree is voiced by Liam Neeson, and has a stature and digital majesty in common with another Spielbergian creation from 2016: Mark Rylance’s titular BFG. And that boy is played by Lewis MacDougall, a 12-year-old Brit who has been lying to himself that his mother’s latest round of treatments will have some effect on her that the previous ones have not. The boy, Conor by name, goes to school with some of the meanest bullies this side of Donald Trump, as they know about his mother’s worsening condition yet push him to the schoolyard ground on a regular basis anyway. Her situation is bad enough that Life After Mum is being discussed sort of openly. An option is going to live with his imperious grandmother (Sigourney Weaver); not an option is moving to America with his dad (Toby Kebbell), who left them a decade earlier to pursue a new life and family. The Entmoot, before CGI turned the kid into Billy Boyd. At 12:07 one night, Conor awakens from a nightmare into something that isn’t quite that, as the yew tree up the hill uproots itself, strolls over and begins speaking to him through his window. The tree advises that he’ll tell Conor three stories, at this same time on the subsequent nights, then expect a fourth from Conor with the deceptively simple requirement of being “the truth.” This monster is preparing Conor for something. In his heart of hearts, he knows what. If Bayona weren’t comparable to Spielberg in his themes and approach, then certainly he’d warrant the comparison in terms of the professionalism of his craft. Watching A Monsters Call, it’s easy to forget this is only the Spanish director’s third feature, after his impressive debut horror flick (The Orphanage) and his follow-up tsunami survival story with horror elements sprinkled in (The Impossible). He’s making a further move into sentimental territory with this film, but not in a bad way. It’s something of a classic case of embedding an emotional message movie within a wondrous fantasy, but again that’s not a criticism. If anything it’s just a conventional use of his prodigious gifts. But they are prodigious, and Bayona is capable of making a wickedly affecting film. Movies in which a character is dying for the entirety of the running time can wear us out by the climax, robbing it of some of its emotion, but Bayona wisely goes sparingly on the screen time for Jones as she descends into the irrevocable. When he does play those cards at the end, they were worth the wait. Though Jones does well with her part, the most affecting moments are between Weaver and MacDougall, incompatible souls who happen to fall on either side of the dying woman on the family tree. In their scenes together, we are reminded of cancer’s pernicious toll on both parents and children. To focus only on this film’s perspective on death is to look past the ways its visuals are wondrously alive. In an era in which computer graphics leave cynical audiences with a sense of “been there, done that,” A Monster Calls freshly awakens some little remaining bits of our awe. The physical incarnation of the monster is impressive, but Bayona smartly uses it in service of developing a character with emotional heft. (That Neeson also “plays” the boy’s deceased grandfather, seen only in photos, certainly contributes to that). 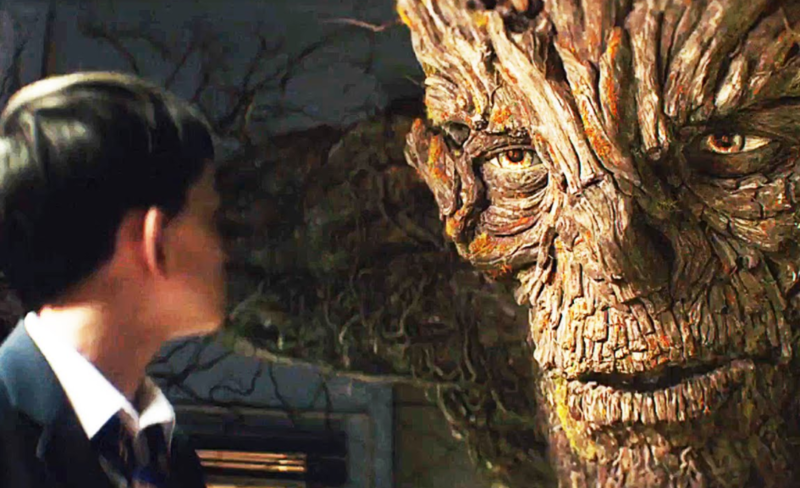 A Monster Calls has visual ambitions that go beyond merely “making the impossible possible.” Perhaps the film’s most captivating sequences are when the monster tells Conor the first two of his stories (the third, for some reason, does not get a visual representation). For five minutes apiece the tales proceed in an angular, impressionistic style that seems like an impossible combination of charcoal and watercolour, sequences bleeding into each other like inkblots traveling across the page. We’ve seen similar artistic choices in other films, yet as is the case throughout A Monster Calls, Bayona does it just a bit better than other people do. To further cement the Spielberg connection, Bayona has been hired to direct the sequel to Jurassic World, where he seems unlikely to ponder loss and separation the way he has in his first three films, most poignantly here. However, there’s sure to be at least one strained family – a brother and sister, a father and daughter – at the centre of the action, and Bayona will probably do that just a bit better than other people do.